Charles Blondin was a world famous acrobat. He was trained as an actobat for six months and then debuted as 'the little wonder'. His acts were popular with the public and in 1855 he went to te USA. There he met his first wife Charlotte in New York. They had three children. On 30 Jun 1859 he became the first person to cross the Niagara Falls on a tightrope. He even stopped halfway to cook and eat an omelet. In 1861 he first appeared in London at the Crystal Palace. When he performed at the Royal Portobello Gardens in Dublin during the same year the rope broke and the scaffolding collapsed. He wasn't even injured, buy two workmen who were on the scaffolding died. Somewhere during the 1870s he retired, but in 1880 he was back. In 1893/1894 he starred in a "Jack and the Beanstalk" pantomine at the Crystal Palace. His last performance was in Belfast in 1896. He died in 1897 of diabetes. 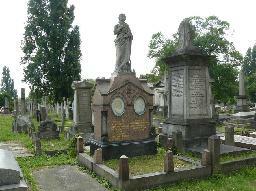 He was buried next to Charlotte, who had died in 1888, at Kensal Green Cemetery. His second wife Katherine was also buried there in 1901. The grave of Charles Blondin at Kensal Green Cemetery, London.